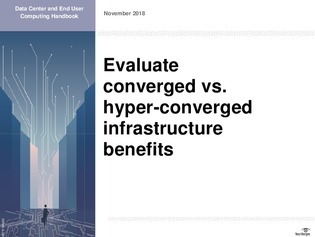 Although the benefits of converged and hyper-converged infrastructure implementation are well documented, each infrastructure model comes with its own drawbacks and differences. For organizations to properly assess CI and HCI, they should first consider the intended use cases, security concerns, ease of use, physical space, virtual components, and long-term scalability needs. Download this definitive e-book on evaluating the benefits of CI and HCI, from which you’ll learn the positives and drawbacks of each, view details on evaluating HCI for high-density data centers, and more.